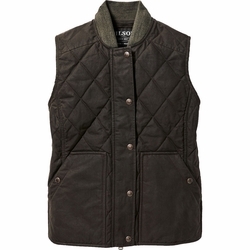 Filson Quilted Field Vest. The Women's Quilted Field Vest has a waxed-cotton shell for water resistance and PrimaLoft Gold insulation for lightweight warmth. Outfitted with a two-way front zipper and snap-close storm flap. A water-repellent insulated vest for use in the field, in town, and anywhere in between.